5 Things to do in Kanchanaburi, Thailand | MOVED to stooffi.com! 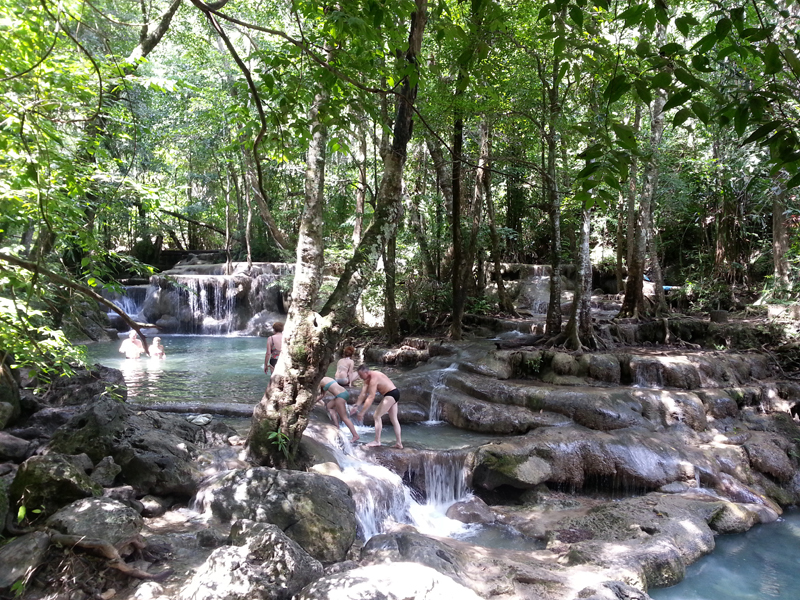 There are seven levels of waterfalls at Erawan, which are all pretty spectacular. Something about the minerals in the water make it seem really blue with sunlight hits. I’d suggest going early, about 9 or 10 in the morning if you’re planning to complete the hike (about 2km up), because we started down at about noon and it was teeming with tourists! Also, wear good hiking shoes that have good grip and you’re willing to get dirty / wet. Oh yes a bathing suit and a small towel too, because you can swim wherever you fancy!Levels 1 & 2 are reasonably easy to access, everything kind of gets increasingly tougher after. Wouldn’t recommend this for elderly. Could be a great family activity though. Spamming you with pics, cos it’s really one of the prettiest places I’ve ever been to! Spectacular view at one of the rest stops. This is the forth level, where people slide off rocks! Watch it happen here. It looked super fun but when we realized that you could slide off the rocks, there were already so many people doing it, we didn’t bother! The top! 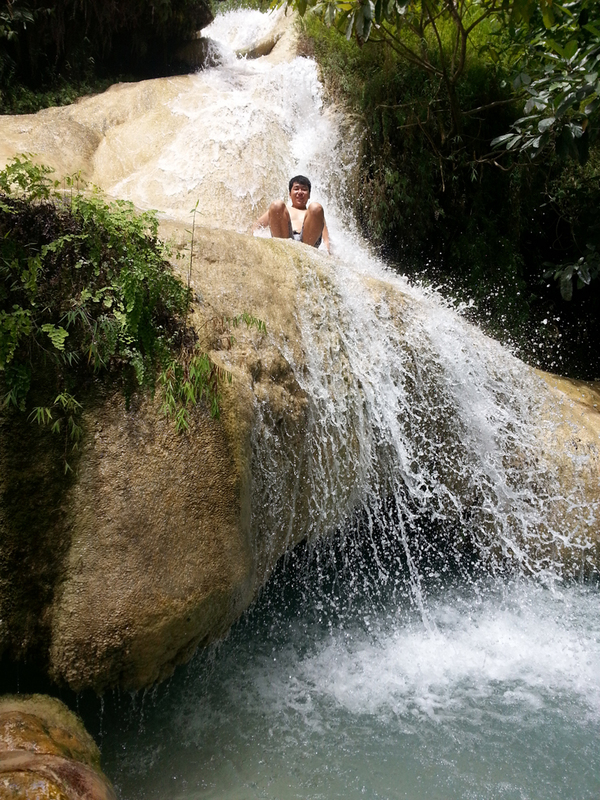 We got to the 7th waterfall and the water was the cleanest and clearest! But watch out for biting fish – they were everywhere, just waiting to nom some human flesh. Alright I kid, apparently they just eat the dead skin off your feet (a la foot spa), but it really isn’t a pleasant sensation, especially when these fish are huge. Just keep moving around to make sure they don’t get to you. Also, watch out for rocks aplenty. 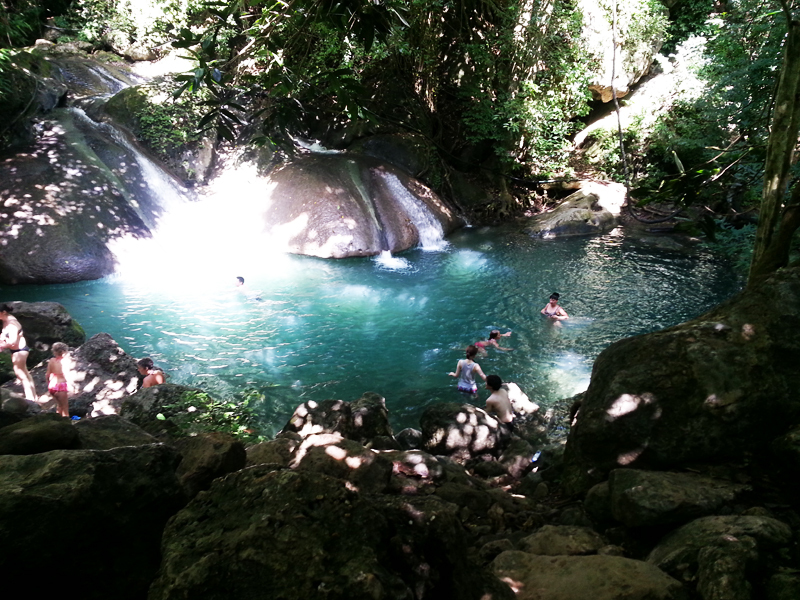 It was really nice splashing into a cool pool after the 2km hike! After which, getting down is way easier. Toilets are pretty nasty, but there are shower facilities (bring your own towel / toiletries). There’s also a couple of eateries near the carpark where you can get local fare for a reasonable price. One thing you should definitely do is get a massage by the river – 300 Baht a person, but the best thai massage I’d ever had (their pattern a lot sia). 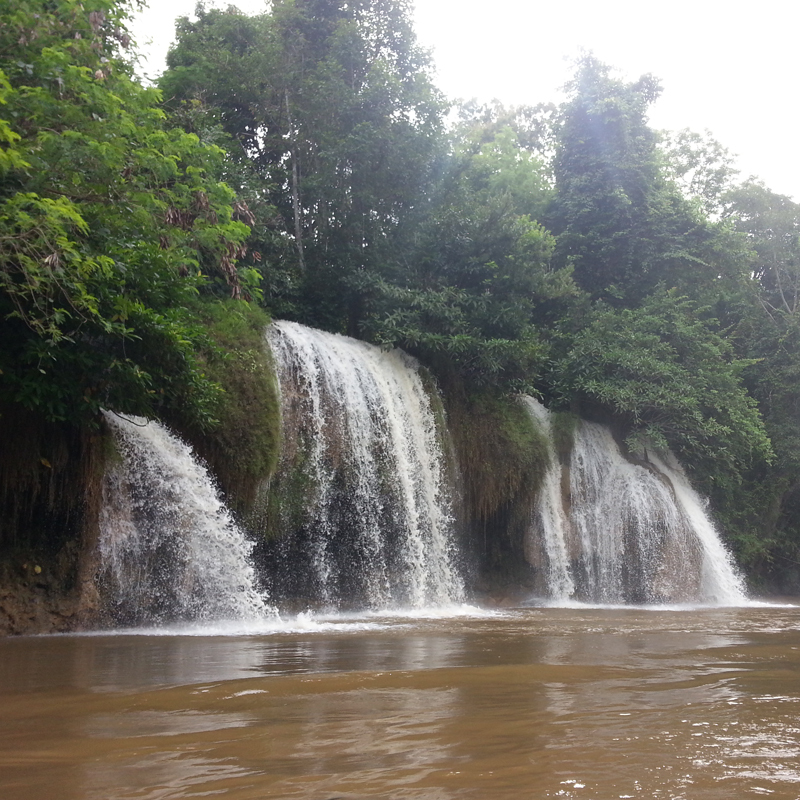 Float down the River KwaiWang Nok offers a raft trip to Sai Yok Waterfall for a small fee. You’d have to check with the receptionist upon checking in what time these raft trips depart – Bob and I missed the free trip at 7am because we woke up too late. So this tug boat literally tugs this huge wooden raft down the River Kwai, headed for Sai Yok Waterfalls which is about 2 miles down from Wang Nok. At some point, you have the option of putting on a life vest and jumping into the river, to let the currents drag you downstream, and they’ll pick you up right at the waterfalls. I know the colour of the river leaves less to be desired but it really doesn’t stink, or make you itch or anything. I’ve never had the experience of being pulled along by a river, so it was quite an experience. Here’s the waterfall! Nothing as extravagant as Erawan, but good enough! And then what they do is to position the raft at the waterfall, and one of the staff crawls into the waterfall to anchor it there. 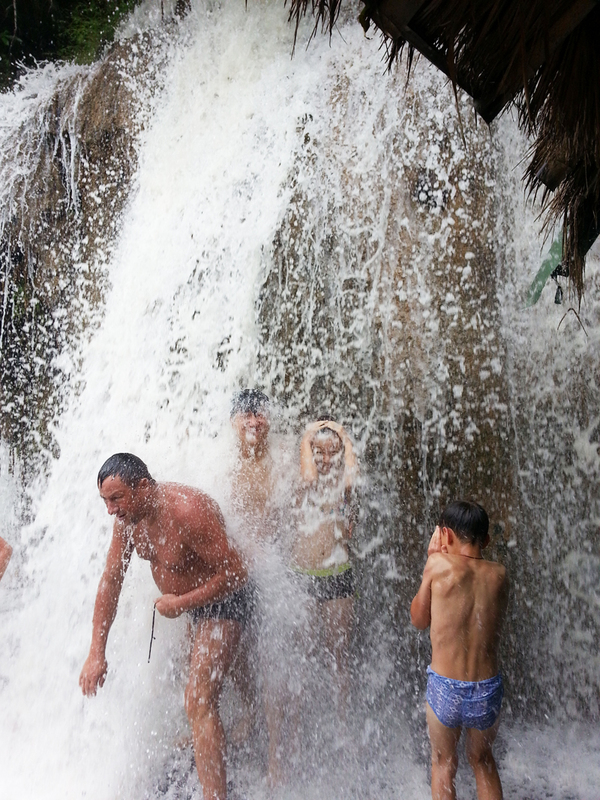 So you get to experience the glorious (rather painful) showers of the waterfall. (Hang on to your bottoms!) And here they’ll serve you freshly cut fruits, while children squeal as they take turns experiencing being beat down by the heavy gushing water… and big burly men enjoy nature’s own massage. … and Asians like us just do a bit of both. 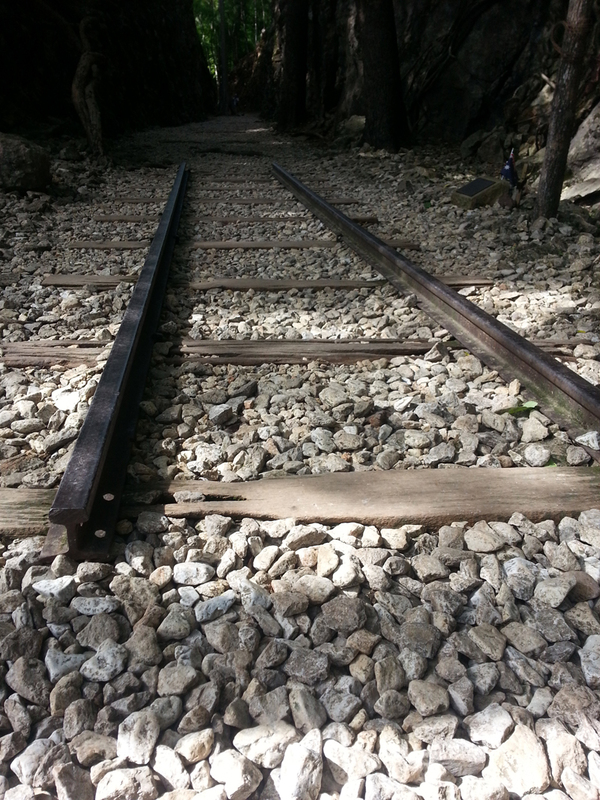 Visit the Hellfire Pass Museum & walk down the railwayThousands of POWs died during the construction of this railway that was constructed to link Thailand to Burma. 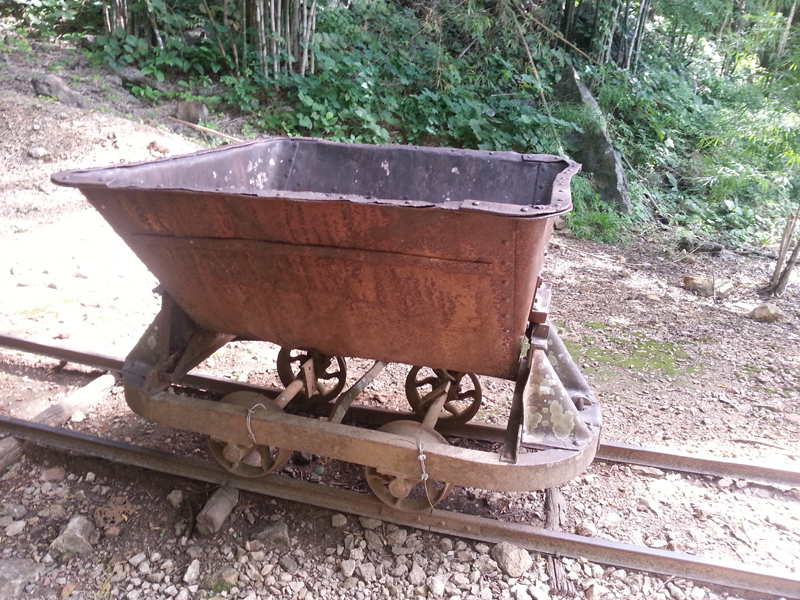 They had to work under ridiculous conditions with rudimentary tools – you’ll read more about it at the museum! Borrow the audio guide and, again, wear a good pair of shoes if you’re intending to walk down the length of the railway (about 4km). Bob and I weren’t too prepared for that because we were in flip flops, and as you can see, the entire pathway is filled with bits of rock! But I heard the audio guide is really good, and it’s a really mellowing and educational experience. Again, I wouldn’t recommend this for the elderly or unfit, because you need to descend (and later ascend) about ten flights of stairs just to reach the start of the walking path. Also, I’m not sure you might want to do it immediately after hiking Erawan. Of course, you could be a real fitness buff, no sweat. I died a little ah, to be honest, but I’m kind of regretting not walking the 4km stretch. P.S. Check out these tented accommodations near the Death Railway. 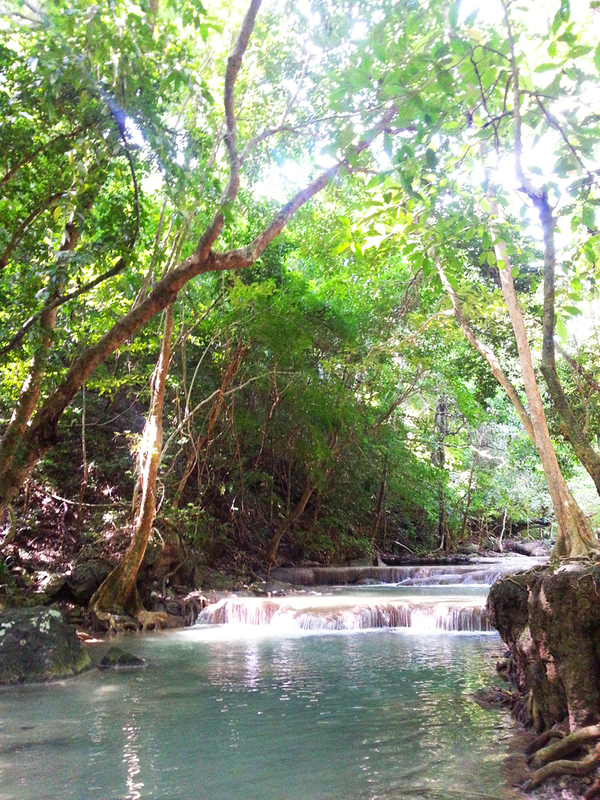 Take a bath in a hot springWho would’ve thought you’d find a hot spring in Kanchanaburi? Head down to Hin Dad Hot Springs for a very unique hot spring experience – none like those I’d had in Taiwan – this one’s really ghetto! 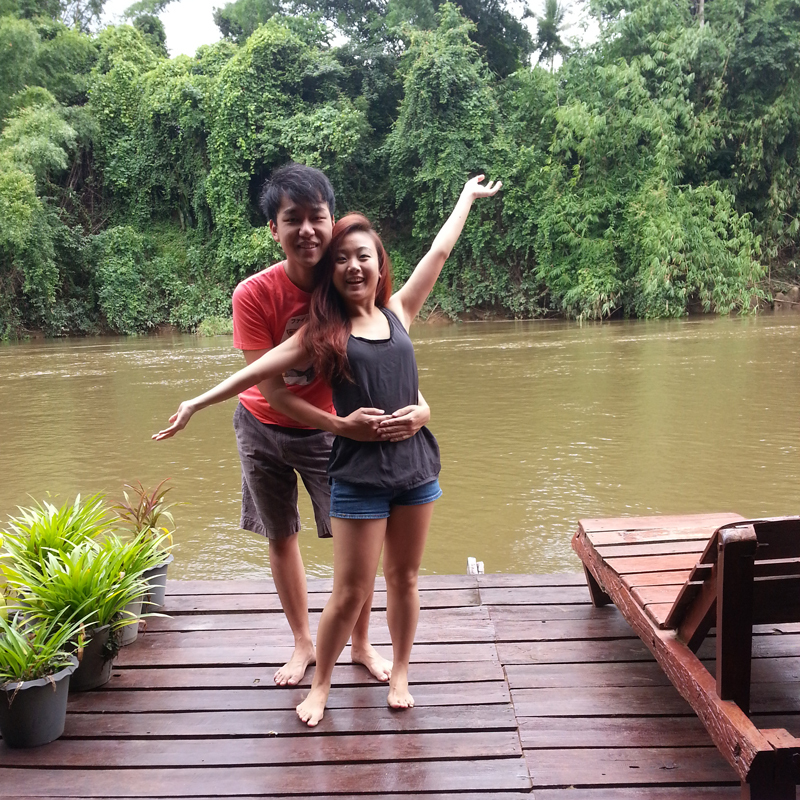 It opens till 10pm so it was perfect after a long day of exploring Kanchanaburi. For the girls, no one really wears bikinis here so come with a shirt you don’t mind getting soaked. Apparently there’s a massage pavillion but we didn’t see any? Perhaps it was because we went a little late. The hot springs were discovered by Japanese who were overlooking the construction of the Death Railway. Looking at this pic, to the right are the hot pools (39 degrees and 49 degrees) and to the left really is just the river where you can cool off in. 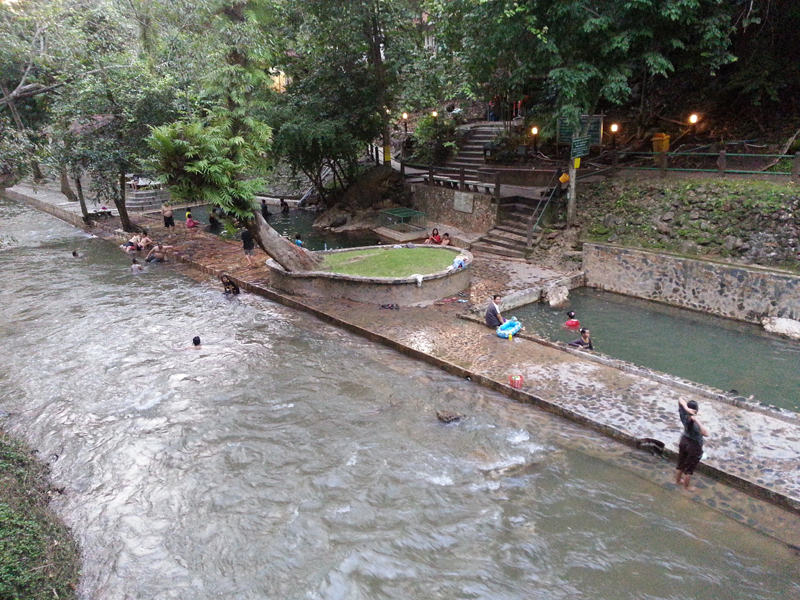 A great spot to relax is the pathway in between, where the hot water flows to the river. It’s quite an experience lying there on the cool stones as hot water flows under you! Another great spot to just cool down and chat with friends is the big step that leads into the river, where you can sit and feel the river water flowing past you. Heads up if you’re staying in Sai Yok just like us – past 8pm and you won’t be able to find many options for dinner! 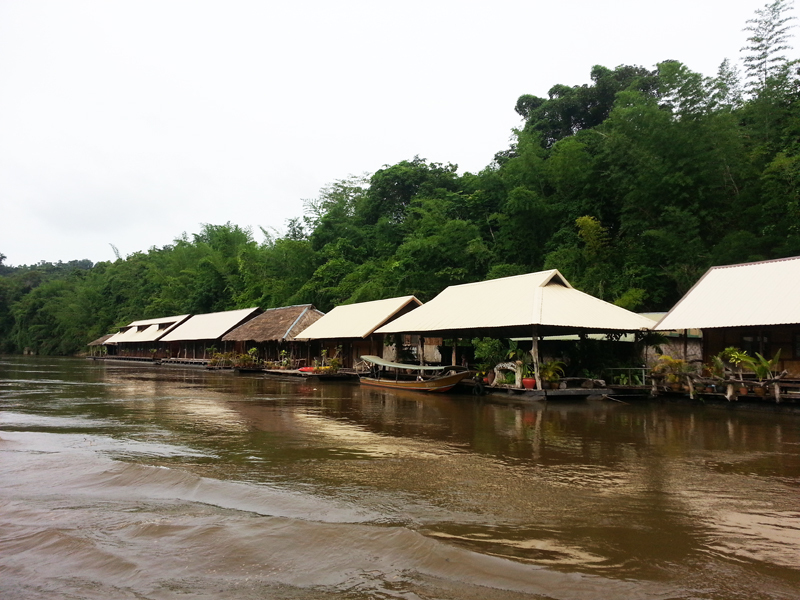 The only thing that was open near Hin Dad / Hellfire Museum was Baan Ricky. Food wasn’t excellent, but we were more than happy to have found a place to eat. Plus they projected HBO on a huge screen! 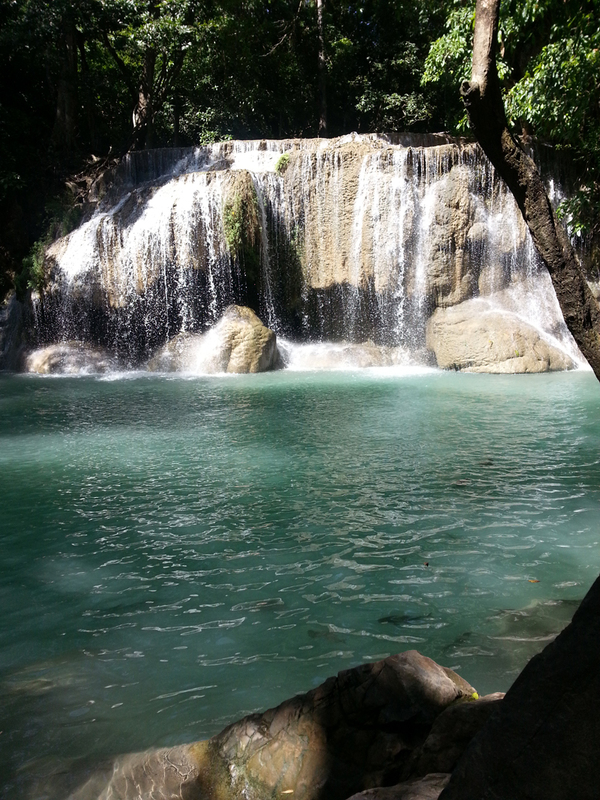 If you realize, most of these activities are off Kanchanaburi town, so having a car is really essential and convenient. Take note that you need a credit card if you’re renting one from Thai Rent-a-Car. If you don’t have one, you can check out High Way Rent, where we were just required to put down 5,000 baht in deposit. 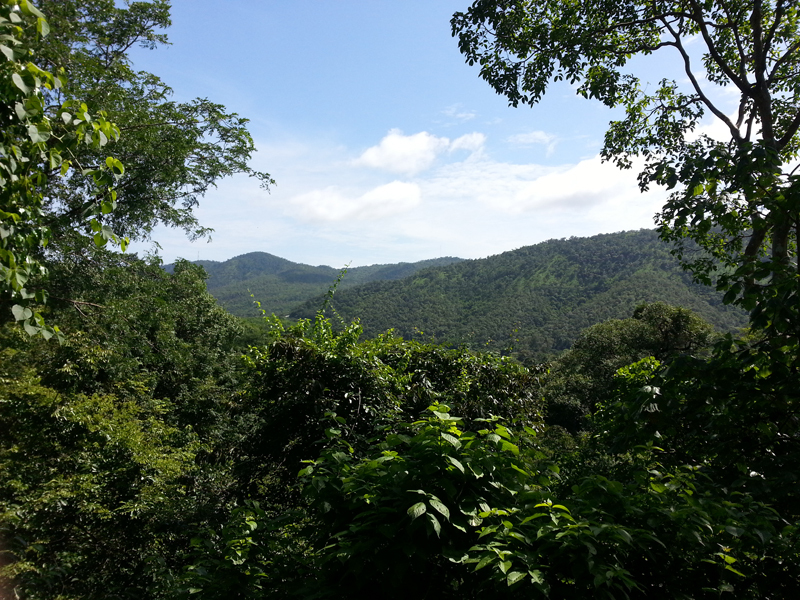 This entry was posted in Thailand, travels by stooffi. Bookmark the permalink.